1. Heat the oil in a thick bottomed pot. Fry the spring onions, garlic and ginger, you may add a bit of salt. 3. Take out the meat pieces and heat up the sauce till it’s boiling. Reduce it quite much. It needs to be pretty dense. 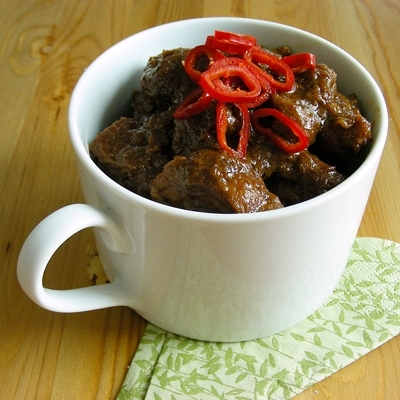 This entry was posted in Beef, Meat, Pork, South-East Asian, World cuisines and tagged Beef, food, ginger, indonesian, kecap manis, Pork, soy, Stein, stew, tamarind by No Onion Please. Bookmark the permalink. Love this Babi kecap, looks so yummy but I can’t wait to see your new recipes on Polish food. Nice sounding recipe. Good luck with your travel dreams!